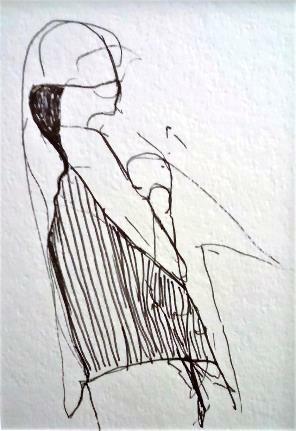 DESCRIPTION: Line drawing, on paper (23.5cm x 17cm) – ‘Motherhood’ refers to the quality or spirit of a mother. ‘Mothering’ itself is non-gender or age specific however the Western tradition, the creative and nurturing sides of nature are often embodied in the form of the woman. The Latin word for ‘nature’ is “natural”, for birth or character & in ancient Greek Ma-ka or “Mother Gaia”, represents all life and Earth Goddess. BIOGRAPHY: BDes / Visual Communication UniSA; BFA, UNSW; 15 years in community arts and project management and founder of the Broken Hill Art Exchange. DESCRIPTION: “This artwork represents molecular water vapors in the earth’s atmosphere. There are three states of water ice, liquid and gaseous vapors. The latter is invisible and only felt through humidity. In my artwork, imaginary molecules are floating and emerging from the surface of Zinc Lakes. The work signifies Natures perfectly balanced chemistry and the greenhouse gases affecting climate change. A primary greenhouse gas is Carbon dioxide created by the production, incineration, disposal and usage of plastic bottles and bags. ‘All in the Wind’ highlights another primary greenhouse gas responsible for the amplification of global warming, water vapor molecules in air.” Susan has a degree in Design / Visual Communication and a Bachelor of Fine Arts. For the past fifteen years, she has worked in art and community development involving developing projects, curatorial programs, exhibitions, and workshops at the Broken Hill Art Exchange Incorporated.